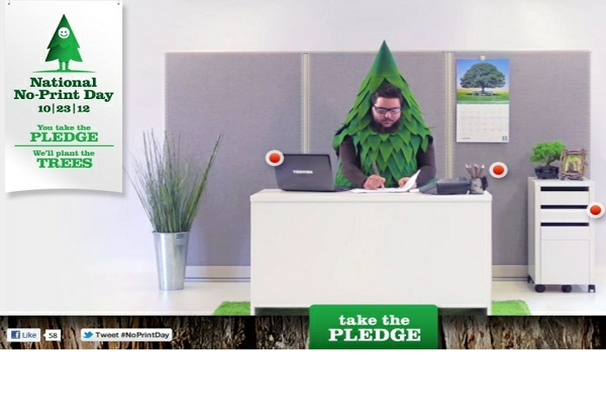 The National No-Print Day website, which has since been shuttered, offered some sobering statistics on our paper-using ways: Some 336,000,000 sheets of paper are wasted every day in the United States--that's more than 40,000 trees a day. y sounded very much like a feel-good PR event designed to a garner a bit of green cred for Toshiba. But the effort backfired, raising the ire of two industry groups: Printing Industries of America, a U.S. industry trade group that argued the event's "no-print" message was off-base; and Two Sides, which called Toshiba's campaign "greenwashing," and claimed it had numerous inaccuracies. "Toshiba seems to have ignored the environmental impact of electronic communications. Just saying you are eliminating print and paper really does not mean you are necessarily helping the planet," wrote Two Sides' member Vince Collins in a June 13 response to National No-Print Day. "It’s a lot more complex than that. If the alternative is, for example, electronic communication, then what is the environmental impact of this?" Collins also took umbrage with another No-Print Day assertion: "Toshiba have linked paper use to deforestation (or killing trees and destroying forests) when, in fact, responsibly made paper can be a sustainable way to communicate. Paper is a highly recycled commodity in Europe, with a recycling rate approaching 70%." A little more than two weeks after announcing National No-Print Day, Toshiba canceled the event. In a June 20 letter to the group's members, Printing Industries of America president and CEO Michael Makin announced that Toshiba had agreed to abort the campaign, which he said "should have been more specific." "It was not promoted as 'let's save office waste day' but rather National No-Print Day," Makin wrote. "I argued this was tantamount to having a 'Do Not Walk' day or 'Do Not Eat' day and that the grassroots response from our industry was only to be expected." If Toshiba re-launches its campaign, the new approach "will explicitly explain that this in no way references the legitimate commercial printing industry and its importance to the American economy," Makin wrote. Well, back to the drawing board, Toshiba. And how dare you tell people to print less? Feel free to pitch alternative campaign slogans below.